Math wizards take note. 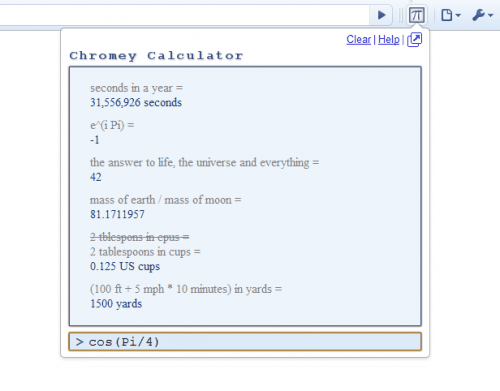 Chromey Calculator is an extension for the Google Chrome web browser that offers access to most of Wolfram|Alpha's and Google's mathematical calculations and functions. The extension places one of those dreaded icons in the Google Chrome header that opens a popup window when clicked on. Mathematical functions -- tan(pi/4), log(10), sqrt(2), etc. Mathematical and physical constants -- pi, e, h, c, etc. Persistent printer tape style history - The extension displays the most recent calculation in its interface. * Ctrl+Click or Cmd+Click (OS X) on any result to copy to clipboard. Chrome users who install the extension should take a closer look at the Google Calculator and Wolfram|Alpha examples. 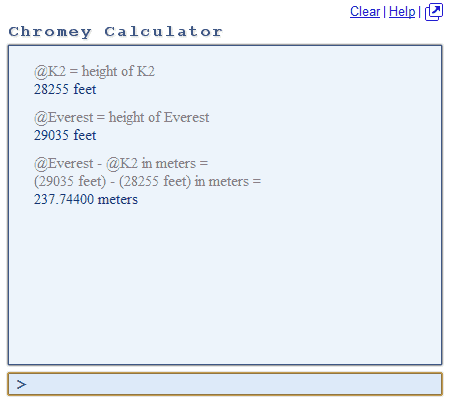 Chromey Calculator can be downloaded and installed from the Google Chrome Extensions Gallery. If you need to do a quick calculation sometimes the easiest way to do that is to fire up your favorite web browser, Duck Duck Go for instance, and have the search engine do the calculations for you. Depending on the search engine, you can use it for more than just basic arithmetic calculations. Some support advanced math, unit conversions, provide you with information about constants or facts. While that is pretty useful in itself, it lacks some of the advanced options that some users might want to take advantage of. A history feature comes to mind for instance that is displaying past calculations and information on the screen that may be important for calculations that take more than one step to complete. The visual representation of what you enter and the results may also not be that suitable or recognizable on the search engine's website. 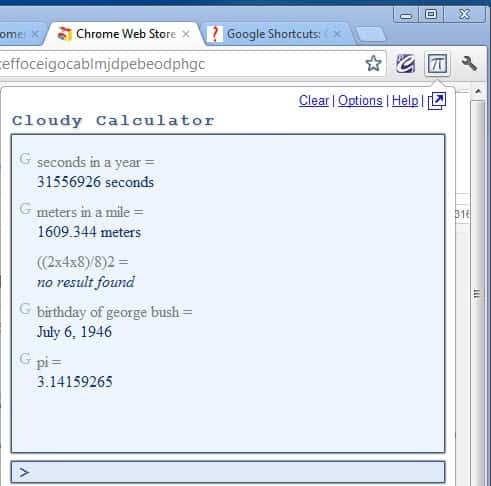 Cloudy Calculator is an extension for the Google Chrome web browser that adds advanced options to Google Calculator. When you install the extension in Chrome, you will notice that a single icon gets added to the browser's address bar that you can click on to activate the interface that you see above. If you prefer keyboard shortcuts, you can enable the Alt-C shortcut in the options instead, and if you want, hide the icon the address bar. The first thing that you will notice is that all previous calculations are displayed in the interface whenever you open it. This is true not only for the same browsing session, but also when you start the browser again at a later point in time. You can naturally clear the history at any time with a click on the clear link in the interface. The calculator supports all calculations that you find on this page plus additional ones. From displaying pi or the mass of the sun to logarithmic calculations and advanced mathematic operations. Next to that, it can also be used to display factual information, for instance the birth day of an important person in time. The factual information are however limited and not really comparable to those offered by the Duck Duck Go search engine or Google's Knowledge Graph. Another benefit that the extension offers is the ability to click on calculations or results to add them to the command line to use them in new calculations. When you open the options of the extension you will find settings to change the font types, the height and width of the calculator's window, and an option to use a local Google URL instead of the default Google url.